Courts that shelter the powerful and evict the little guy. When we speak of the Roberts Court as a “corporate court,” we mean a court in which big business has a heavy thumb on the scale and the ordinary citizen finds it harder and harder to get a fair hearing. Fair or not, the Roberts Court helped bring that descriptor upon itself in 2010 with its landmark ruling in Citizens United v. Federal Election Commission, in which it found that corporations have a First Amendment right to spend unlimited amounts of money from their general treasuries on election ads [see Jamie Raskin, “Citizens United and the Corporate Court”]. It wasn’t just a tiny tweak to First Amendment law, although the five justices in the majority doubtless saw it as such. With the doctrinal reification of “corporate personhood”—seemingly placing it above human personhood—the Roberts Court established a political metaphor that would keep on giving to progressives throughout the Occupy Wall Street effort, the Wisconsin recall election and on into the presidential race. But how does one measure the ways big business is faring at the Roberts Court, and whether it’s happening at the expense of ordinary citizens? We can start with a study in late June by the Constitutional Accountability Center showing that the US Chamber of Commerce, the powerhouse business lobbying group, had seven straight wins this past term at the Court—a vastly better record than it had during other recent periods of stability in the Court’s membership. When Lewis Powell wrote his famous 1971 memorandum urging the Chamber to press its agenda in the courts, in academia and in the media to give the business community a larger and more unified voice in the legal system and society at large, he could hardly have dreamed of the gains made by the Chamber and other pro-corporate entities in the decades since [see William Yeomans, “How the Right Packed the Court”]. Another measure of the Supreme Court’s favoritism for corporations over ordinary people lies in the ways it has eroded access to the courts for ordinary litigants in recent years. It’s worth recalling that the courts exist as the one branch of government intended to be immune from the kind of concentrated and wealthy influence contemplated by the Powell memo. The judicial branch was conceived as the one above-the-fray realm where ordinary people—those without lobbyists, Super PACS or position papers—might still find a fair hearing when they were wronged. But one of the central projects of the conservative legal movement in recent decades has been to recalibrate that balance, allowing big business to throw up roadblocks to the courthouse doors and make the courts less and less accessible to the people it has harmed. damage awards.” These technical-sounding doctrinal shifts, taken together, have worked to make it ever more difficult for injured Americans to find their way into a courtroom. As Chemerinsky puts it, “Each and every one of them undermines accountability by strongly favoring defendants, governments, government officials and businesses.” Courts—once the refuge of the little guy—have now become bastions to shelter the powerful instead. Start, for instance, with class-action suits, which have long served a critically important function in preventing and punishing employment discrimination. In many cases, poorly paid individual workers cannot afford to file their own suits, or know of patterns of discriminatory behavior by their employers, or find legal representation for what look to be paltry damages; they also fear retaliation for reporting acts of discrimination. For years, class-action suits have tried to level the playing field for workers and their corporate bosses, leading to injunctive relief and huge changes in corporate culture. Even the Chamber of Commerce has conceded that class actions are more efficient than piecemeal individual suits. Yet in a series of cases beginning with AT&T Mobility v. Concepcion and Wal-Mart v. Dukes, both in 2011, the Supreme Court has systematically ensured that it will be more difficult for litigants to band together to bring such suits. In Wal-Mart the five conservatives on the Court overturned a lower court’s decision to certify a class of female Walmart employees, raising fundamental questions about what common patterns could even define a future class, and leaving the women of Walmart to fend for themselves in smaller classes or individual suits. Wal-Mart has already been invoked by lower courts to deny class certifications [see Craig Becker and Judith Scott, “Isolating America’s Workers”]. The AT&T ruling not only dealt a blow to the power of class-action suits; it further cemented the conservative justices’ preference for mandatory arbitration over judicial resolutions and jury trials. Big businesses generally prefer to keep disputes away from juries and judges for many reasons, among them—as Professor Judith Resnik has shown—the fact that paid arbiters institutionally tend to favor the companies that pay them; the absence of an appeals mechanism; and the secrecy inherent in the arbitration system. Arbitration absolutely makes sense in many situations, but when there is a profound imbalance in bargaining power or—as was true in the AT&T case—no clear agreement between the parties to resolve disputes through arbitration, the trend to push cases into arbitration may end up harming consumers, workers and other Americans who had no idea they were signing away their right to litigate until after they were injured. Another dramatic shift in doctrine has occurred as the Court revised what are known as “pleading standards” by significantly increasing the factual showing a plaintiff must make to proceed in the court system. This seemingly technical fix means that many more plaintiffs cannot include sufficient detail in their pleadings to allow their cases to go forward. There has been a longstanding tradition of permitting what’s known as “notice pleading”—essentially a short, plain statement of the facts—on the theory that it is better to give plaintiffs their day in court than bar entry before the case can begin. In a crucial 2009 decision, the Court changed that presumption by finding, in Iqbal v. Ashcroft, that a Pakistani man held after the 9/11 attacks by the Bush administration had not alleged sufficient facts to allow him into a courtroom. The new standard gives judges the power to determine whether the plaintiff’s claims are “plausible”—a dramatic shift from the notice pleading system, and one that has allowed hundreds of cases to be dismissed before they could begin. Other cases, such as Arizona Christian School Tuition Organization v. Winn (2011), have made it harder for plaintiffs to establish what’s known as “standing” to gain access to the courts in the first place. And still other decisions, such as Connick v.
Thompson (2011), have made it more difficult to sue government entities for wrongs done—in this instance by prosecutors who hid exculpatory evidence, resulting in a man being wrongfully sentenced to eighteen years in prison, fourteen of them on death row. This past term the Court has again signaled that it may continue the trend of keeping litigants from having their day in court. During oral arguments in February, the conservative majority indicated in Kiobel v. Royal Dutch Petroleum Co., which will be reargued this term, that it is inclined to make it vastly more difficult to hold corporations responsible for human rights violations overseas. It announced in Hosanna-Tabor Evangelical Lutheran Church and School v. EEOC (2012) that it would not protect disabled employees’ claims of retaliatory firings by religious organizations. And in Knox v. Service Employees International Union, Local 1000 (2012), the Court’s conservatives reached out to opine on a matter beyond the scope of the case—about speech rights and union members—simply to send a shot across the bow of public employee unions about nonmembers and right-to-work laws. The list goes on and will continue to go on. By manipulating seemingly technical rules—from pleading standards to standing to class-action requirements—the Roberts Court has made it harder and harder for employees, consumers and defendants to seek justice in court, and easier for big companies, government agencies and polluters to evade accountability. Ultimately, that’s the real concern here for anyone who cares about social justice, equal rights, the environment and fairness. 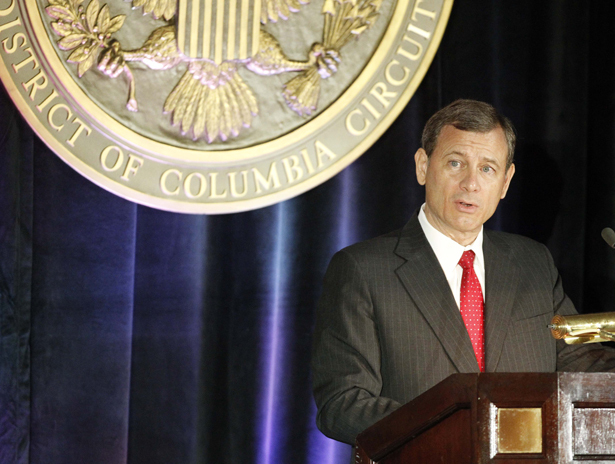 The singular project of the Roberts Court has been, in effect, a complicated form of self-abnegation: a systematic transfer of authority away from the judicial branch—the one branch capable of acting as a check on unconstitutional majoritarian impulses and overweening corporate power—and a concerted effort to funnel plaintiffs into arbitration, individual and inefficient suits, and a form of legal powerlessness that hurts everyone. There is ample language in the Court’s recent rulings to demonstrate that judges are ill suited to resolve social problems, that such efforts should be constrained and monitored and fundamentally mistrusted. But it’s one thing to trim the sails of the judicial branch; it’s quite another to transfer power that once rested with the judiciary directly back to groups that hold power already. Whether it’s through forced arbitration, limited class certification, shifting burdens of proof or other subtle tricks, the Court has gone beyond locking out litigants and well into the realm of aiding and abetting powerful corporate interests. Ruth Bader Ginsburg is 79. Antonin Scalia is 76. Anthony Kennedy is 76. And Stephen Breyer is 74. The 2012 election is not just about jobs, the economy, the privileged few, and a government that can be bought and sold by secret, powerful interests. It is also about a Supreme Court that has stood before, and can stand again, as the last bulwark against the privileged and the unaccountable. The question, now more than ever, is whether we are willing to fight to have that Court again.